The GPS modernization program is adding new civilian signals to the GPS constellation. The new signals use a modernized civil navigation (CNAV) message format that is more flexible than the legacy navigation (LNAV) message on the original civil signal (C/A code). CNAV also offers modern features such as forward error correction. The Air Force currently broadcasts CNAV messages on L2C and L5, from all operational GPS satellites capable of transmitting these signals (namely, GPS IIR-M and GPS IIF). The L2C and L5 signals are currently pre-operational and should not be used for safety-of-life or other critical purposes until the government declares them operational. The pre-operational CNAV message for L2C has its health bit set to "healthy," while the pre-operational CNAV message for L5 has its health bit set to "unhealthy." The government is making the pre-operational CNAV messages available for user familiarization and for equipment development. Operational declarations for L2C and L5 will require implementation of new monitoring and control capabilities in Block 1 of the Next Generation Operational Control System (OCX). The Air Force began broadcasting CNAV messages on L2C and L5 in 2014. Prior to that, these signals only transmitted a default message containing no data (Message Type 0). A quarterly meeting of the U.S. GPS Program's interagency Civil Navigation Signals (CNAV) Tiger Team occurred 5 March 2015 to discuss the new L2C and L5 GPS civil signals. CNAV Message Types 10, 11, 30 and 33 are currently transmitted on seven GPS IIR-M (L2C) & eight GPS IIF satellites (L2C & L5). A Modernized Navigation (MODNAV) Tool integrated with the GPS ground control software (Architecture Evolution Plan or AEP) is generating the CNAV data messages. 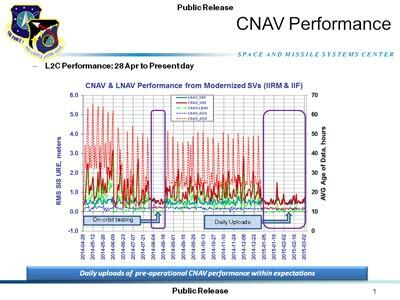 Daily CNAV uploads began 31 December 2014, and the U.S. Air Force reports that signal performance of CNAV matches or slightly outperforms Legacy performance: average user range error (RMS URE) from 25 February – 3 March 2015 was 0.50 m for Legacy and 0.57 m for Modernized; best week for Modernized signals since the broadcast initiated April 2014 was 0.42 m for 6 – 13 January 2015. Users are reminded that these CNAV signals are "pre-operational" and should be employed at the users' own risk until they become fully operational; the L5 message is currently set unhealthy. In June 2013, the Air Force conducted a live-sky test of CNAV capabilities on the GPS L2C and L5 signals. The event provided an opportunity for civil users and manufacturers to participate in L2C/L5 evaluation and prepare for future L2C/L5 operations. The Air Force published its test plan, dated May 30, 2013, prior to the event. The document reflects inputs received on a draft plan released for public comment in March 2013.